For many people in the cities, long days at the office, traffic, pollution, and lack of time can create stress and mental and physical fatigue. To bring them back in touch with nature and to explore our blend of traditional farming wisdom and modern practicality, from innovative eco-solutions to practical spiritual living, Matrikunj—‘Mother’s Grove’, the sustainable development arm of Sri Aurobindo Society, organized a day-long retreat for a first-hand, up-close experience of a self-sufficient practice of natural, organic and conscious farming on March 25, 2017, from 9 am to 5 pm. The day started with a brief walk at the farm where the facilitator, Baburam, explained about the importance of diary and crop farming together in the same land. He went on to explain the significance and advantages of rearing cows and their produce in a farming environment and about vermicomposting. As the participants walked towards the fields where they would gain some practical experience, Baburam pointed out some interesting aspects of the trees planted along the way, highlighting their uses in daily life. 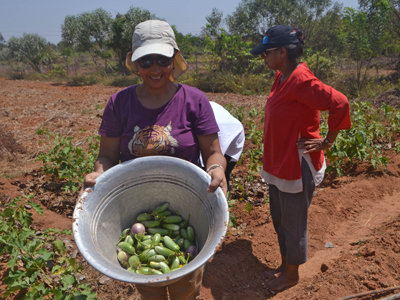 Once at the field area, the participants got involved in harvesting tomatoes and brinjals (also known as eggplant or aubergines). 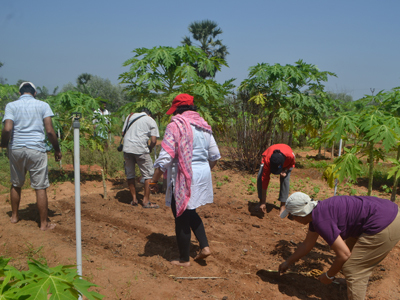 They also sowed some seeds of okra, cucumber, ridge gourd, pumpkin and bottle gourd and were made to understand the different ways of sowing as per the nature of the seeds and the plant. In the midst of this fieldwork there was a short juice break where organic hibiscus juice (made on the farm) was served. After the fieldwork, the participants had a short theoretical session on herbal pesticides and participated in the chopping of the various leaves that would be required in the making of herbal pesticide (which would also work as a fertilizer and nourishing agent). They were then shown how these various leaves were mixed with cow urine in a barrel and would be used after a few days to spray on the vegetation around. Around 12.15 pm the group returned to the main office area and were served a delicious lunch with most of the ingredients coming from the farm itself. This was followed by a short rest period in the mango grove after which everyone went out for a walk towards another part of the organic farm. Here, Baburam introduced the visitors to the various medicinal plants that he has been growing. Participants got to touch, taste and smell the various herbs in this sensory session and learn about their interesting properties. The walk ended in the casuarina grove where they were served a special herbal tea and rice powder cake. Before they left, the participants helped in making some laddoos made from coconut and organic jaggery produced on the farm. They got to take the laddoos back with them as souvenirs along with packets of puffed red rice and drumsticks harvested that day. Matrikunj is a 43-acre organic farm, belonging to the Sri Aurobindo Society, located on the outskirts of Puducherry. It is here that research work is being carried out to develop ways of creating a model self-sufficient farm through the practice of natural, organic and conscious farming. Matrikunj was awarded an ‘Organic’ certification from the Tamil Nadu Organic Certification Department in 2013. By blending elements of various farming methods such as permaculture, bio-dynamics, natueco farming, homa farming, use of indigenous microorganisms and so on, Matrikunj seeks to depict the interconnectivity of nature, health, animal welfare, community and environmental sustainability such that it may inspire and educate others to consciously choose agricultural practices for a holistic and harmonious future. Indeed, what is practiced here is conscious farming through the development of a strong and vibrant relationship with the land, the implementation of farming techniques based on the natural ecosystem processes and the approach to agriculture in an integral manner. 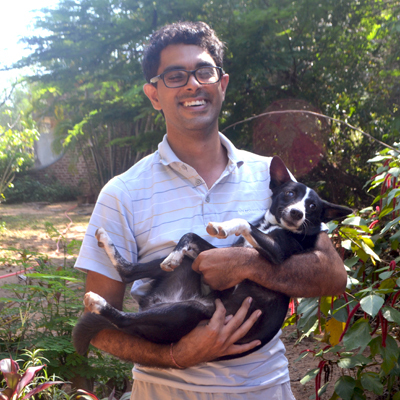 Baburam is our residential agriculturist, herbalist and innovative researcher, originally from a farming background in Odisha. He joined Sri Aurobindo Society in 2003 and has been deeply involved in the growth and development of Matrikunj ever since. Inspired from the Mother’s teachings and words, Baburam has experimented with various natural and organic farming techniques and is now an ocean of knowledge and experience. His efforts have been recognized and awarded by South Asia Rural Reconstruction Association (SARRA).